Hillsdale College hosts hun­dreds of ath­letic events every year. These events require much prepa­ration, setup, and coor­di­nation in order for every­thing to run smoothly and for teams, ref­erees, and fans alike to enjoy the event. Behind all of this is one hard-working, unsung hero: Rich Alvarez. Alvarez has worked for Hillsdale College as the ath­letics equipment manager for 23 years. Most of his work takes place behind the scenes at football, bas­ketball, and vol­leyball games. He travels with the football team, driving the bus with the support staff for the team, which includes student trainers, student filmers, and student coaches. In years past, Alvarez would load and unload the equipment bus and drive for long dis­tances wherever the equipment was needed for the team — some­times as far as 13 hours away. Now he has a team of 10 stu­dents, most of them ath­letes them­selves, ready to help him out with loading and unloading the busses, as well as any­thing else he may need with his job. Once at the game, he makes sure the side­lines are ready for players and coaches, setting up field markers, head­phones, extra helmets for players, and equipment for trainers. At home games, Alvarez has a similar job. He makes sure the ref­erees know where their locker rooms are and that they’re com­pletely ready, well stocked with ice bags, heating pads, or any­thing else the ref­erees might need. He takes pride in pri­or­i­tizing the vis­iting team and making sure they’re greeted, know where to go, and have all their equipment with them. 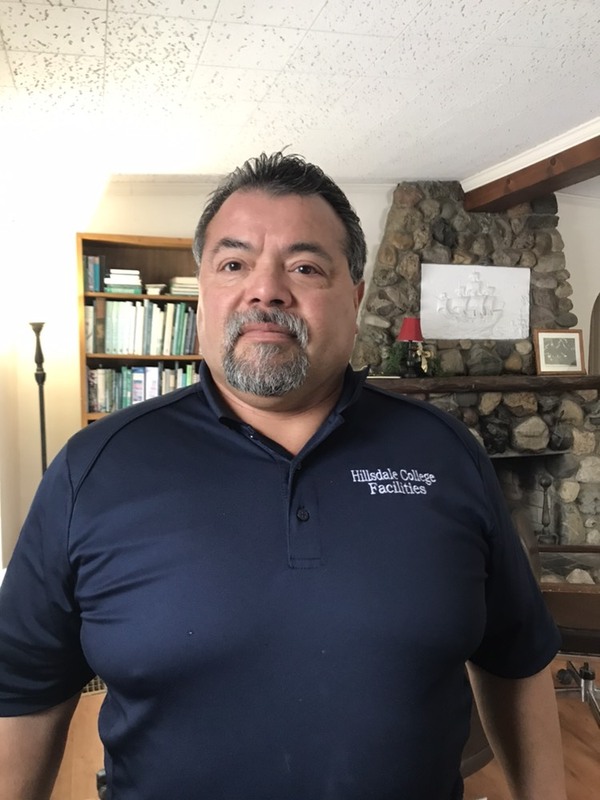 Though Alvarez has always called Hillsdale home, he was born in Abilene, Texas into a family of nine children, one of whom cur­rently lives in Jonesville. He is still very close with all of his sib­lings and loves to spend time with his 17 nieces and nephews, though he says it can get dif­ficult with so many con­flicting schedules. Through his sister, Alvarez met and married his wife JoAnn just a few years ago. Alvarez told the story of how his sister, from the same high school grad­u­ating class as JoAnn, ended up in charge of planning their class reunion. Because she was living in Texas at the time, she asked Alvarez to help out with most of the legwork in Hillsdale, and because he did so much to help, she invited him to come along to her reunion. JoAnn almost didn’t attend. Her car had broken down on her way to the reunion, but Alvarez said some­thing was telling her “you’re more than halfway there, just keep going,” so she went to the reunion, met Alvarez, and the two began dating. JoAnn now works at Bon Appétit, and Alvarez said they eat lunch together almost every day. “It’s a rare occasion that we don’t,” he said. Alvarez has also spent a lot of time in the past coaching a variety of sports from softball to baseball to wrestling. He started out by offi­ci­ating baseball and then moved on to coaching both baseball and softball for kids ages four or five all the way to college-age. Though his work schedule keeps him busy, Alvarez said he loves to fish in his free time, espe­cially in the summer, and has even tried a bit of ice fishing in the winter. He also loves to read, work out, and spend time with his wife. Chris Stewart, a senior baseball player who works on Alvarez’s student equipment team, revealed a little bit about what it has been like to work side by side with Alvarez over the past three years. He went on to describe the rela­tionship between Alvarez and another student on the team, Ryan, who has since grad­uated. Pat Hornak, director of football oper­a­tions and Alvarez’s best friend, says the two would share endless jokes on the many long drives to away games. They shared the same ones so many times now they don’t even need to finish the joke before they are both laughing at the mem­o­rized punchline. Alvarez’s work, though almost entirely behind the scenes, is essential to the smooth oper­ation of the many sports games that Hillsdale fans enjoy every season, according to Stewart.